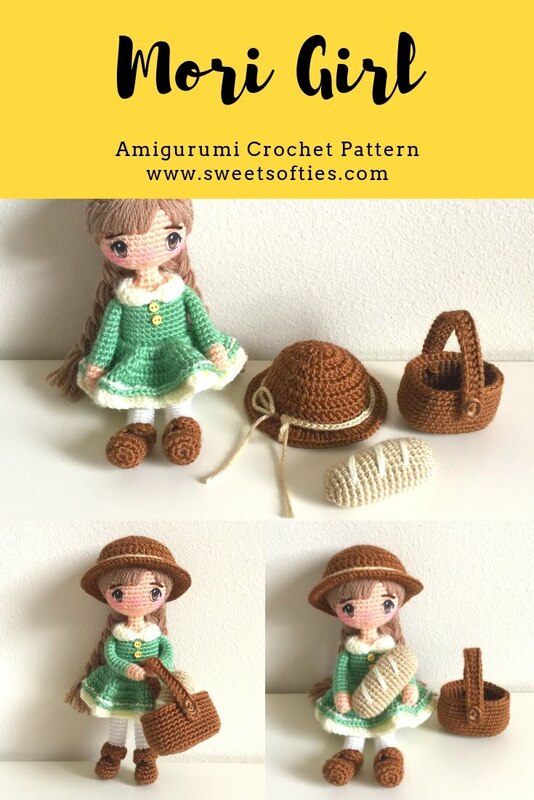 The Mori Girl Doll Pattern provides instructions for crocheting this sweet doll from start to finish. In this pattern, you will be guided through the doll-making process with written crochet instructions, reference photos, and finishing directions. You will learn how to make the doll, clothing, accessories (hat, basket, bread), hair, and eyes with a special anime-style eyes tutorial. The Mori Girl is a delightful, young lady who lives in an Old English cottage and leads a simple life. She wears a beautiful sun hat, a long-sleeved, collared dress, white stockings, and brown boots. She also carries with her a wicker basket and a warm loaf of freshly baked bread. The Mori Girl enjoys reading storybooks and fairytales, indulging in arts and creative crafts, baking breads and sweets, decorating her cozy home, and taking nature walks in the beautiful outdoors! I would like to personally congratulate you as your Sweet Softies | Amigurumi & Crochet Blog has been selected by our panelist as one of the Top 50 Amigurumi Blogs on the web. I personally give you a high-five and want to thank you for your contribution to this world. This is the most comprehensive list of Top 50 Amigurumi Blogs on the internet and I’m honored to have you as part of this!